Scientists in South Africa on Friday launched the world's first optical telescope linked to a radio telescope, combining "eyes and ears" to try to unravel the secrets of the universe. The device forms part of the Square Kilometre Array (SKA) project in the remote Karoo desert, which will be the world's most powerful radio telescope system. The latest move combines the new optical telescope MeerLITCH—Dutch for 'more light'—with the recently-completed 64-dish MeerKAT radio telescope, located 200 kilometres (125 miles) away. "We are listening and looking at the sky at the same time—that is a completely novel concept in astronomy worldwide," Paul Groot, from Radboud university in the Netherlands, told AFP. "This is the eyes, with the MeerKAT being the ears as a radio telescope. It is fantastic to see what amazing views it produces." Astronomers have previously had to wait for a cosmic incident to be picked up by a radio telescope and then carry out optic observations afterwards. 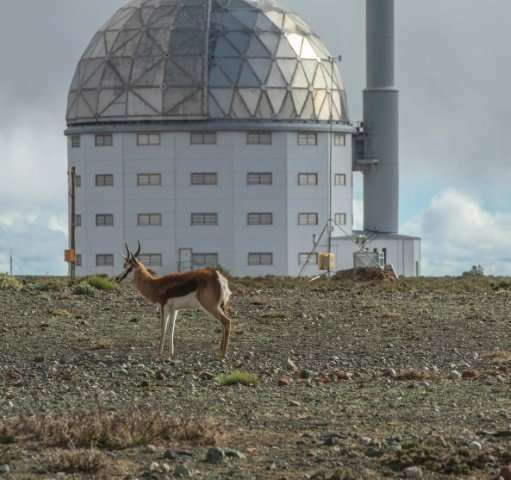 But combining MeerLITCH, in the small town of Sutherland, with MeerKAT, also in the sparsely-populated North Cape province, will allow simultaneous study of cosmic events as they occur. "It is the first time you have a telescope that will track a radio telescope so that if there are discoveries that are made, you will be able to follow up," Phil Mjwara, director general in the South African ministry of Science and Technology, told reporters. The optical telescope, built in the Netherlands and shipped to South Africa, uses a main mirror just 65 centimetres in diameter and a single 100 megapixel detector measuring 10 cm x 10 cm. 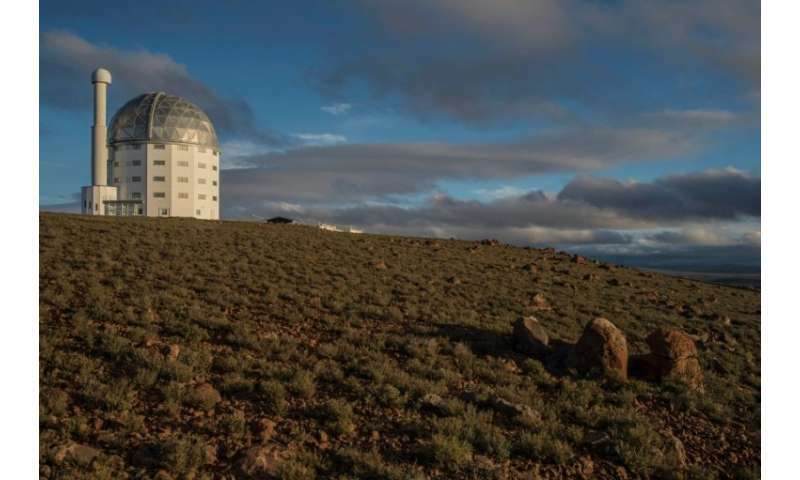 It is housed in a white dome-shaped building made of carbon fibre to protect it against temperature fluctuations in the Karoo desert, which was chosen for its clear skies, dry climate and lack of pollution. Among the priorities for MeerLICHT, which cost about $1.1 million (940,000 euros), is the study of black holes, neutron stars and stellar explosions, which must be scrutinised quickly before they fade away. "The study of exploding stars across the universe will gain a whole new dimension," said University of Cape Town professor Patrick Woudt, a senior scientist working on the telescope. MeerLICHT boasts of a huge field of view that allows astronomers to see an area 13 times the size of the full moon in exquisite detail, and pick up objects one million times fainter than is possible with the human eye. "The brilliant thing is that we are tracking at the same time with the two telescopes, so as soon as we see something in the radio we can look back in time," said Ben Stappers, an astronomer from Manchester University. "Flashes of radio emission known as Fast Radio Bursts may now be 'caught in the act'. Hopefully we can finally determine the origin of these enigmatic flashes." When fully operational in the 2020s, the SKA will comprise a forest of 3,000 dishes spread over an area of a square kilometre across remote terrain in several countries to allow astronomers to peer into space to an unparallelled depth.